The finalists for the Writers’ Trust/McClelland & Stewart Journey Prize were announced this morning at an event at Ben McNally Books in Toronto. Jurors Craig Davidson, Saleema Nawaz, and Q&Q review editor Steven W. Beattie selected three nominees from a longlist of 13 stories. U.K. writer Tyler Keevil is nominated for his story “Sealskin” (The New Orphic Review). He is joined by two Vancouver writers: Lori McNulty for “Monsoon Season” (Descant) and Clea Young for “Juvenile” (The Fiddlehead). The winner will receive $10,000, with each shortlisted writer winning $1,000. The journal that published the winning entry will also receive $2,000. 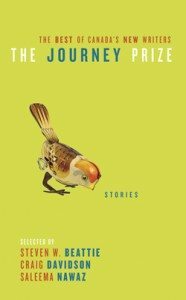 All 13 longlisted stories will appear in the annual anthology The Journey Prize Stories, published by M&S. The collection will be available Oct. 7.